World-renowned mountain climber Chris Warner will speak Thursday, Oct. 15, at 7:30 p.m. in the University of Wyoming College of Arts and Sciences auditorium. World-renowned mountain climber Chris Warner will deliver the inaugural lecture in a University of Wyoming series named for a UW alumnus who died in a climbing accident in 2006. The first Todd Skinner Leadership Lecture will begin at 7:30 p.m. Thursday, Oct. 15, in the College of Arts and Sciences auditorium. 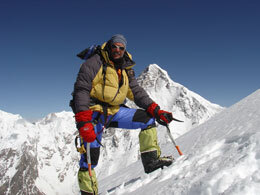 Warner's presentation, titled "Ascending the World's Most Dangerous Mountain: K2," is free and open to the public. The author of "High Altitude Leadership," Warner is a veteran keynote speaker for Fortune 500 companies, including Google. His lecture recalls his many climbing adventures, including a harrowing ascent on the highly-dangerous K2 mountain in the Karakoram Himalayas. Skinner, a 1980 UW graduate from Pinedale who helped pioneer gymnastic rock climbing, was featured on the cover of National Geographic in 1996 following his ascent in the Karakoram Himalayas with three other Wyomingites. He died in an October 2006 climbing accident at Yosemite National Park. The Todd Skinner Leadership Lecture is sponsored by Summit Leadership of Wyoming, a recognized student organization on campus, the Associated Students of UW, the UW Outdoor Recreation Program, the Todd Skinner Foundation, Army ROTC, Solid Rock Outdoor Ministries and Friends of Nepal at UW. For more information, call Mark Peterson at (307) 766-2054 or e-mail markpete@uwyo.edu.